“We are satisfied with the installation service at the working site by your esteemed company, along the whole month of the installation periods, your engineers has always been sticking to his post and working conscientiously. They are working with our workers and even give up the rest and work overtime at the night shift. They go to the working site and then return back more than 10 hours each day without compliant. They devote all their attention to guide our workers to operate and debugging. They often climb up and down to operate themselves”. Considering this project is a aid package of China to The Kingdom of Tonga, Engineer Wang and Direct Zhang says: we feel the broader responsibilities on our shoulders”. It is certainly true that Direct Zhang faced unprecedented challenge since we established the business cooperation with our clients. The clients said when they were signing the contract. Everything has not been over, greater challenges lie ahead. Short lead times, not only brought great pressure to the sales, but also to the procurement, financial, factories and other departments. Finally, after the full cooperation of various departments, they completed the delivery on time. Company sent a senior engineer, Mr Wang of 54-year-old, for installation. With the lessons drawn from others' mistakes, on one hand, Director Zhang make the client be sure to take care of Wang's daily diet, on the other hand, he meticulously probed into the characteristics of client and possible difficulties with Wang. Tonga belongs to tropical rainy climate area, and at that time, there was only about one month away from the rainy season. However, in accordance with the normal speed, the installation of such a stone line would take 2 to 3 months at least. "The project must be completed before the rainy season!" Customer's requirement is the command. During the installation, there was almost half-time were rainy days. Wang endured his pain, often climbed up and down personally. In order to drive time limit for the project, he always worked with local workers in the rain. Eventually, it only took 31 days to the successful completion of the overall commissioning and trial production. Afterwards, the customer purchased accessories which can be used for three years from SBM. Wang organized technical seminars as soon as he returned the company to discuss and summarize the emergence of a range of issues and experiences. When engineer Wang and director Zhang received the letter of thanks and gifts sent from the client, Zhang said excitedly: "A thing's completion, not only of more than one ring sets, but also the help and coordination from other departments. It is simply unable to complete it just with one person and one department. This letter of thanks belongs to everybody! This business is of great significance for our company. Every year, China would provide aid in many countries, and Tonga is a member of the United Nations. Maybe just a small activity, it will affect Tonga's attitude to China in the UN voting. Therefore, I think, as Chinese, we must do it very well, it is our responsibility! " 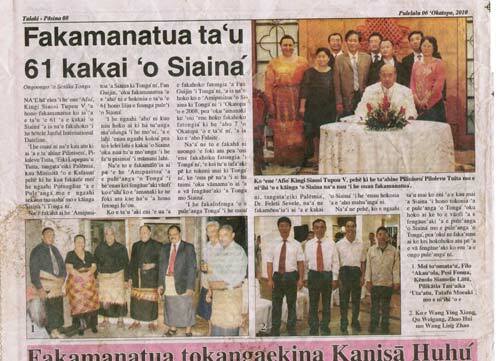 On September30, the Chinese Embassy in Tonga celebrated the 61th anniversary. The King of Tonga, George TuPu V, siad in his speech" During the 12 years after we established diplomatic relation, all-round bilateral relation in-depth development of friendly ties between the two countries was improved. China provided various forms of assistance to Tonga within its capacity and brought tangible benefits to the people of Tonga. Meanwhile, China respected for Tonga's national conditions andTonga people's own choice, its' aid never attached with any political conditions. After the meeting, the King of Tonga visited the installation site. The local newspapers of Tonga Kingdom carried a report on the incident, the next picture is the photo of the heads of Tonga and SBM installation engineers.